We had a awesome field trip today to a local farm! It was quite a muddy adventure after the weeks and weeks of rain we have had, but we wore our boots and toughed it out. We started our tour by getting a show from the two turkeys that live on the farm. They followed us around on our whole field trip and were part of our class by the end of the trip. Some of the children did not like their funny features and sounds, but some of the little kids surprised me how much they liked the turkeys! Our next stop was as tour of the green house or the “hoop house.” We got peel back and open some kale seeds, and smell some fresh garlic that was curing. Our next stop was the chicken coop. The children got to hold the chicks and also go inside the chicken coop to collect some fresh eggs. We also got to view the meat producing chickens, and see how they move around their coops throughout the farm. Our next stop was the outdoor garden! There were so many plants to look at, but we first found a bunch of ladybugs. Farmer Marisa also pulled up a teeny tiny carrot! C loved seeing, holding, and smelling the vegetables! He looks like a true chef! What did you find A? We made some wishes at the weeping willow tree, and met Farmer Tom who runs the farm! Then we went to the barn for a quick lesson about the difference between “straw” and “hay” from Farmer Tom. Then we met some wild and adorable piglets! Lastly we got to feed Dolly and Lollipop! We were completely tired and hungry after all that so we had a picnic snack. We were so lucky to have the clouds finally break for the morning and get to enjoy such a memorable experience! We will definitely be back again in the years to come! Categories: early childhood education, field trip, preschool, Uncategorized | Tags: animal study, animal unit, animals, farm themes, farms, field trip, get outside | Permalink. As we began our journey to learning more about animals, I went through my classroom library searching for any books that would work well to kick off our study! Next thing I knew I had a huge pile of Eric Carle books. His books are beautiful, easy to read, and classics that all children love. We started reading “Brown Bear, Brown Bear” every day for a week before we went outside. The children loved the repetitive nature of the story and singing it along with me. We added “Baby Bear, Baby Bear, What do you see?” and “Polar Bear, Polar Bear What do you see?” to our favorite song book list. When you are reading books with your children at night, take some time to talk to them about the author/illustrator of the story, where their names are located, and where they can find the title page inside the book. These are great early literacy skills! I just happened to pick up “What’s Your Favorite Animal?” by Eric Carle at the library. The children were very intrigued by the picture on the cover. The discussions kept going back to the funny animal on the front page and what were all of the different types of animal parts that made the cover picture. After some discussion about this silly animal the children wanted to make up their own animals too. We studied the covers and illustrations of Eric Carle’s books and looked closely at the paints, lines, and textures he created in his pictures. Then each child got a turn to paint two large pieces of thick watercolor paper with paint. They put the paint on very thick and then used forks, cups, popsicle sticks and rollers to make different impressions on the papers. I got the idea for this from Merri Cherry’s blog and Eric Carle. Below is a picture of A making marks on her beautiful blue painting. The right side shows an up close picture of orange paint that was scraped with a fork. M is below painting her large paper, and then getting ready to scrape it! T and H working together painting and scraping their papers. For some reason I always love the aftermath. Here is our table after everyone was done painting. There is something really satisfying about a messy workspace and children that got busy painting the morning away. Once the papers dried, Mrs. Brittany and I cut apart different animals parts to make “creation station” of sorts. We cut out silly animal heads, some with long necks, bear heads, bird heads, etc. We cut out wings of different shapes and sizes, and legs that were webbed, flat, curved, and had hooves. The children came over the cut up pieces and picked what they liked best to create their own unique, one of a kind animal. Once their animal was completed, we dictated a story about their mixed up animal. What an amazing project! This will definitely be done again in the future! I think I had as much fun seeing their mixed up animals, as they had creating them. Categories: early childhood education, preschool literacy, Uncategorized | Tags: animal study, animal unit, animals, eric carle, favorite authors, inquiry, inquiry based preschool, play based preschool, process art, reggio emilia inspired, reggio inspired | Permalink. We have had so much fun exploring animals of all different shapes and sizes! This animal unit of study came about from the children playing with these large sized animals from Learning Resources, as shown below. They are great toys to have around the house, because you can get them muddy, dirty, and even covered with paint and they wash right up! They also provide the type of open ended play that can go on and on without a intended goal in mind. They might made a great gift to fill up an Easter Basket? We made animal footprints with our large animals by dipping them in a plate of paint. The girls thought this was really fun! I was hoping that the “prints” of the animals would show up a bit better, but they enjoyed the process so much I decided that wasn’t important. I love how C decided to make his animals have a little dance party, and it made his paint smear all over the paper. It is amazing what happens when we let go of our “ideas about what they should do” and just let the children explore freely. I set up this really fun cutting activity last week for the children at the table using crepe paper. My good friend is a pediatric OT, and she shared this simple idea with me. It was a fun and unique way to practice our scissor skills while standing, moving, and cutting something unique. A bath mat flipped upside down, marbles, and tongs. The children all worked diligently to fill up the bathmat. After they had used every last marble in the room H asked if there was anything else they could use for the project. I got them some gems to fill up any of the last holes on the mat. The marbles required more fine motor skill to keep them from rolling away, but the finished product of the whole mat filled with objects was really neat to see. I love when they will stick with a project for the entire duration! We had a whole group discussion about what we already know about animals (which was a WHOLE LOT) and what we wonder about animals. The overall theme that kept being discussed is where animals live. They knew the names of many of the habitats, but we unsure of some of the animals that lived in each biome. I have decided to move along those lines with our animal study, and we got our hands dirty playing in a sandy safari habitat above. I used my sand cloud dough, added my large safari animals, scoops, rocks, and fake large leaves. The weather was so beautiful we were able to have the sensory tub outside with the doors open to the school. I found M and D building this awesome animal habitat with the blocks. I loved how the used the hollow blocks turned sideways and each little animal had a resting place inside the block. 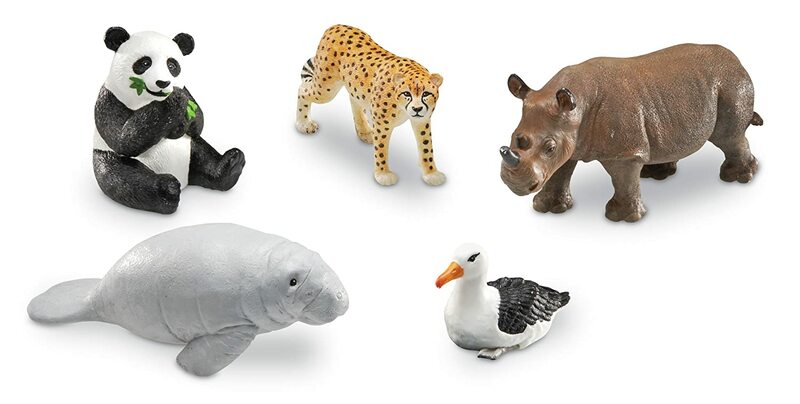 After morning meeting we also sorted our mini animal figures into two categories: wild animals and tame animals. We read Dr. Suess’ new book “What Pet Should I Get” and discussed which types of animals live in people’s homes. They were especially interested in animals such as birds or turtles that can be found in the wild AND in people’s homes. Such detailed discussions happening everyday! Lastly, the children came in last week to find this blank rainforest mural hanging up in the classroom. I got the foundation of the mural started, and then each day we added a new animal to the mural to make it complete! Although many of the animals are bit more on the “crafty” side as far as projects I choose to do with the children, I wanted to make a finished product that would allow them to visualize the rainforest. I tried to choose child made animals as much as possible! The toucans were cut out using paper that they had painted for their Eric Carle project. They added feathers and eyes to their birds. The snakes were stamped using painted bubble wrap. Above is a picture of J painting the bubble wrap green, and then we pressed the plate onto the bubble wrap. Lastly, we painted anteaters using forks and dipping them in brown paint to make the fir. The mural turned out beautifully, and after we celebrate St. Patrick’s Day this week, we will begin our mural of the savannah. Thank you for coming along on our animal adventures! Categories: early childhood education, preschool science, reggio emilia inspired, Uncategorized | Tags: animal study, animal unit, animals, classroom environment, collaborative art, fine motor, fine motor activities, fine motor skills, inquiry, inquiry based preschool, learning resources, mural, play based preschool, preschool science, reggio inspired, scissor skills, sensory play, sorting | Permalink. We have had a fabulous time discussing Penguins at school. I haven’t had a chance to share all of the wonderful things we did during our Penguin unit. The first few days we looked closely at pictures I had printed from Antarctica images I found online. We talked about how different this environment looked compared to where we live. The pictures were hung up on our Penguin chart for children to look at further during choice time. We read some fabulous Penguin fiction and non-fiction books. 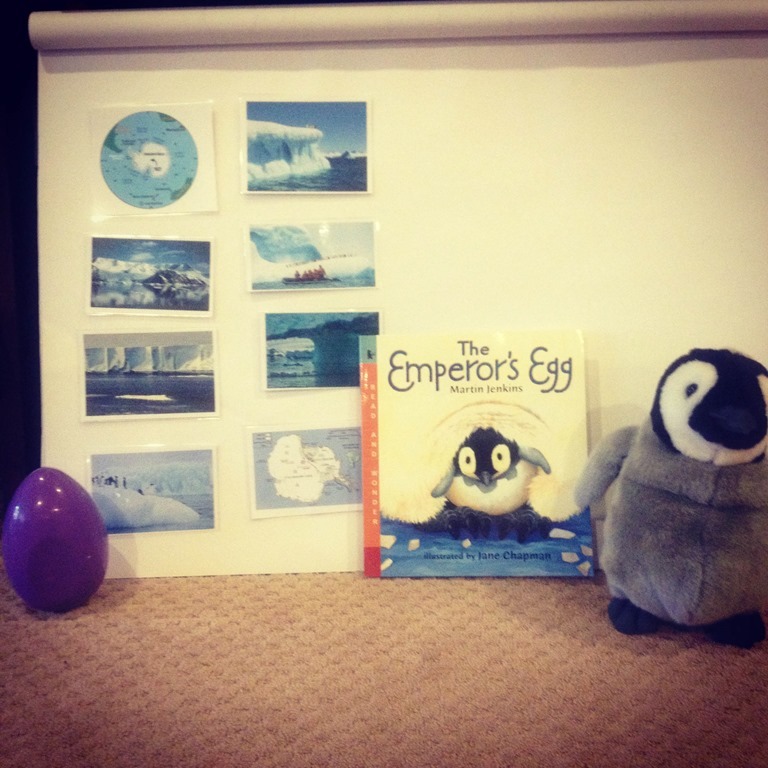 The children especially liked the book, The Emperor’s Egg pictured below. After reading the book we waddled, huddled, dove, and acted like the penguins we had been reading about. I also found a very large plastic Easter egg. Each child tried holding the plastic egg between their feet just like the Daddy Emperor Penguins. 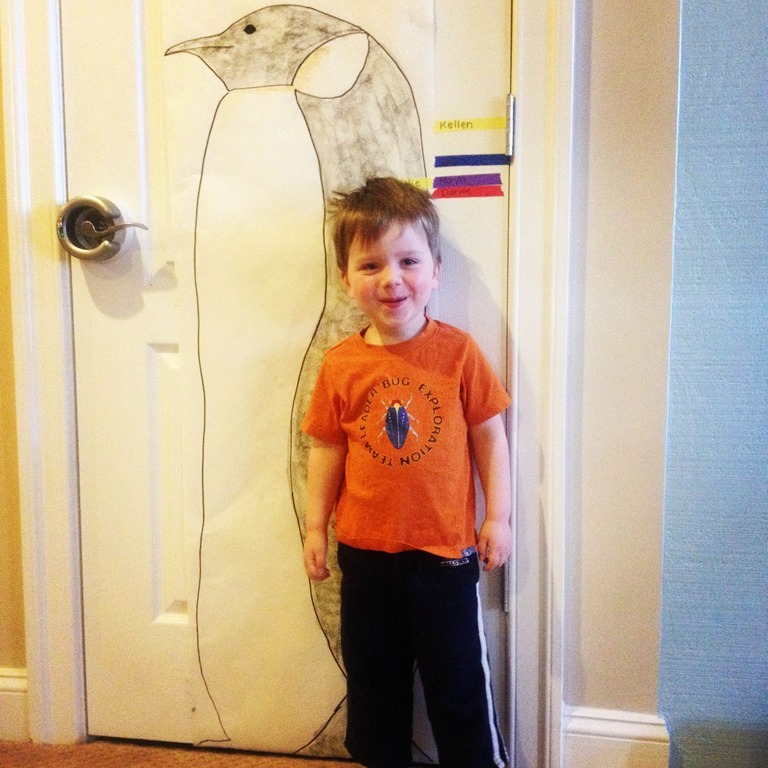 Above is a picture of D standing in front of our drawing of the Emperor Penguin. We measured each child and of course me too to see who was taller than the male Emperor Penguin. Only I was taller! Very interesting! We did two different penguin art projects. One was stamping the penguin with sponges. At the end of the stamping the children glued on the penguins eyes, beak and feet. 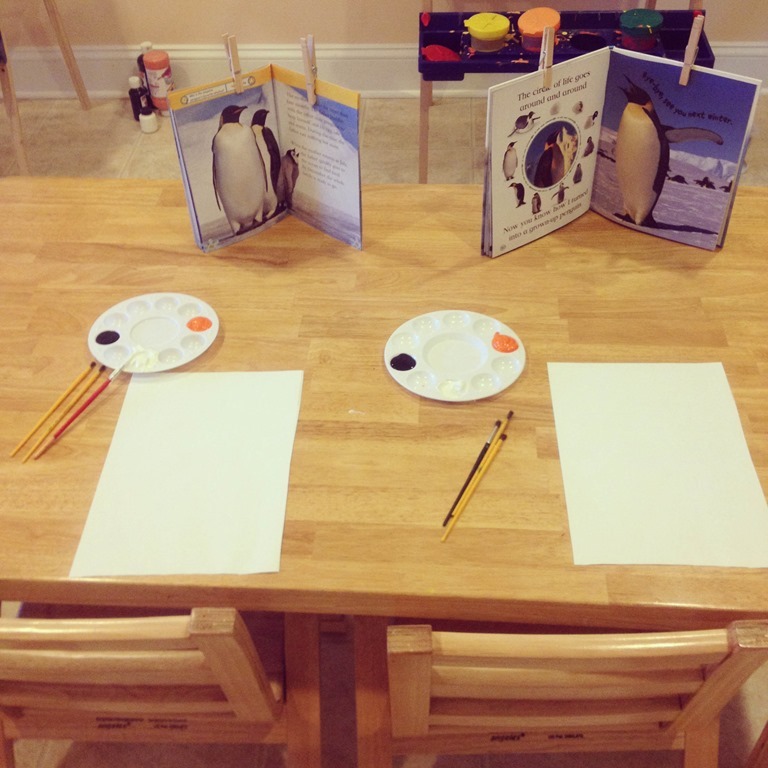 Below is a picture of our invitation to paint a penguin. I had black, white, and orange paint set out for each child. Then I collected some of our non-fiction penguin books for them to look at more closely while they were painting. Once many of the children got started with their painting they kept talking about the Macaroni Penguin. I didn’t have a real photograph of one, but I did have Eric Carle’s book with the Macaroni Penguin inside it. I quickly grabbed the book, and a few of the children painted a macaroni penguin instead. I need to take a picture of their paintings, because they are quite impressive! 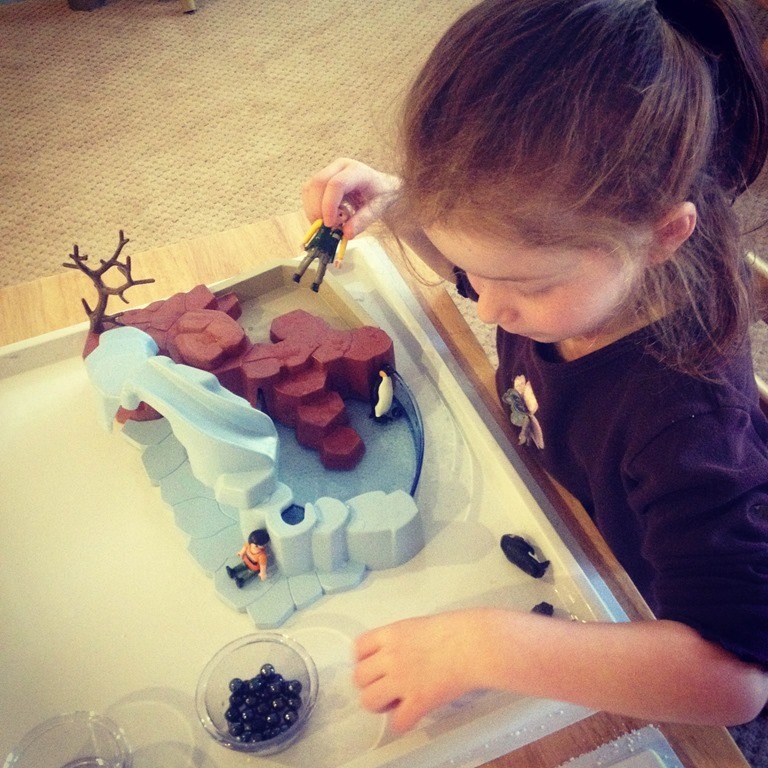 A few weeks ago I made a large “Artic” Sensory bin. The children were mostly interested in the penguins and the Polar Bears. Here is L looking in the water and finding different animals to look at more closely. 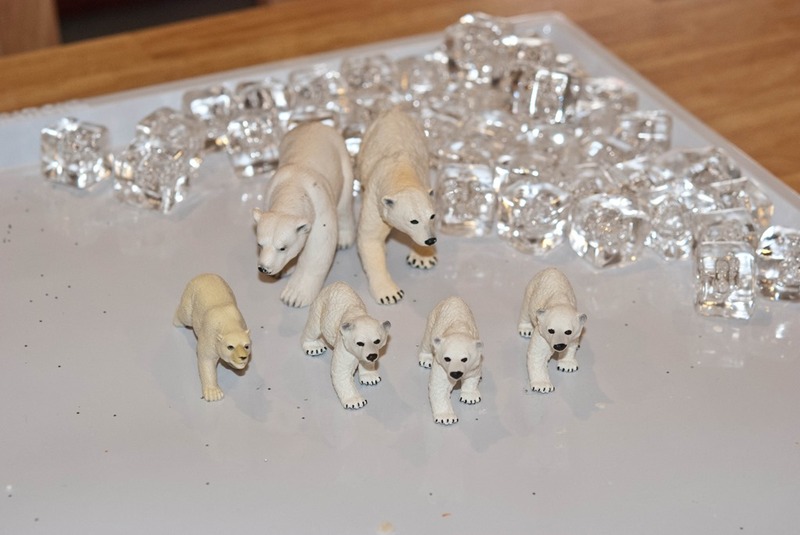 I also had Polar Bears out with the acrylic ice cubes as a table invitation. 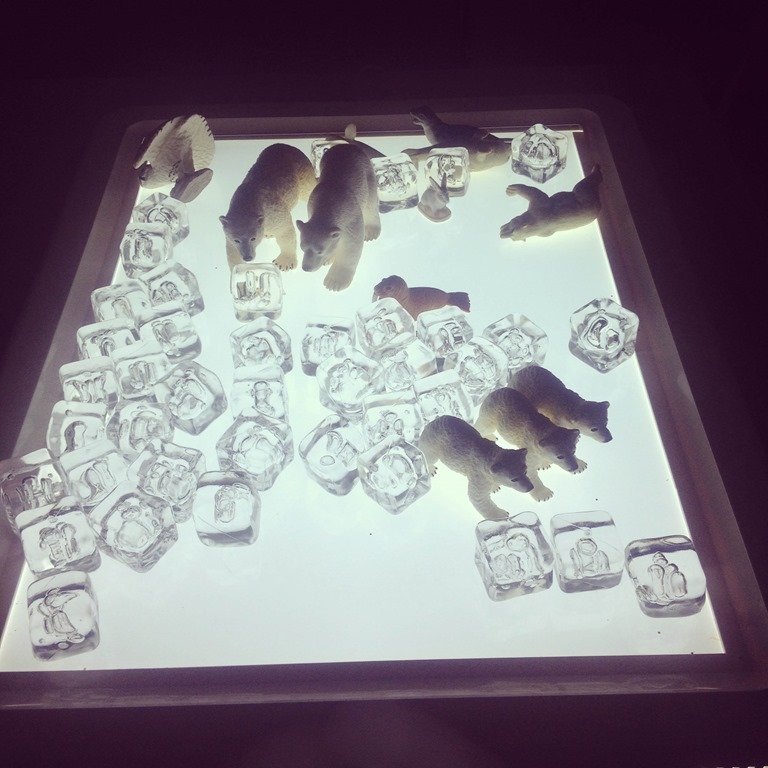 I decided they might look really neat on the light table, so I shifted the bears to the light table for a few days as well! After our artic bin had been explored, I changed it to just a penguin sensory bin. I still had water, penguins, Styrofoam to be ice burgs, but I added gems to be fish for the penguins and a sorting try to sort the gems or penguins into. 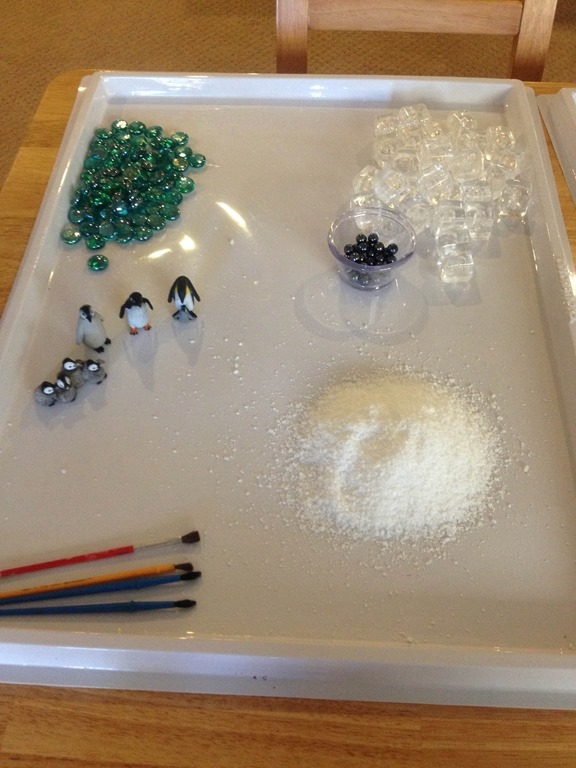 Another table invitation to play was the Emperor Penguins from Safari Ltd, Epsom salt, gems, acrylic ice cubes, and paint brushes. The children did a lot of exploring with this tray! 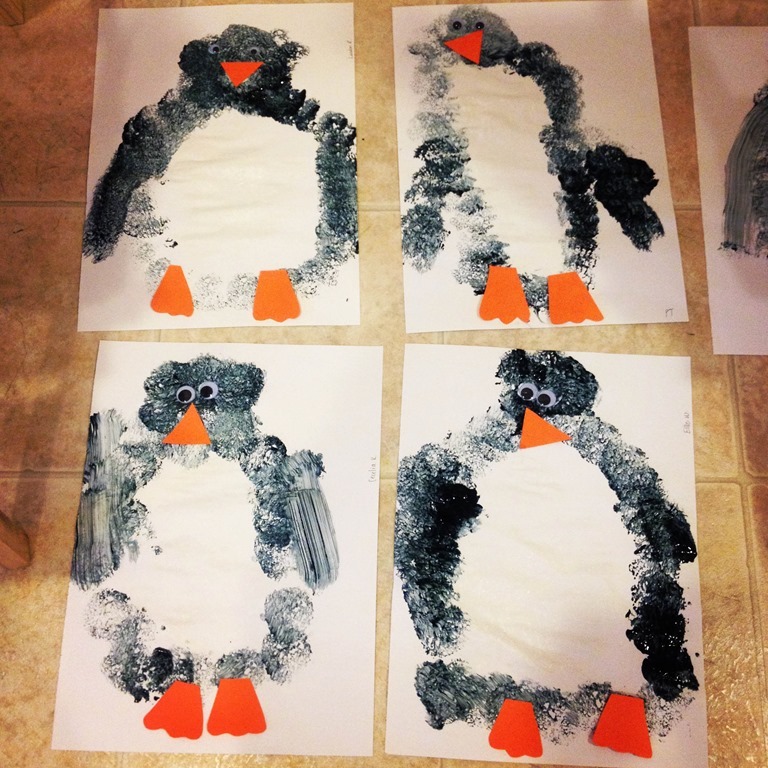 They made it snow on the penguins, painted or made trails in the salt with the paint brushes, and also used the gems to enhance their play stories. Here is P exploring another table invitation that was set up during our Penguin unit. I have the Play Mobil Penguin Zoo exhibit. This was a hit! Every child took a lot of time to play with this tray! There is a dish that slips into the Penguin tray and can be filled with water. They fed the penguins, slide them down the slides, and even visited the zoo as the little boy. We also sorted types of Penguins using a penguin matching game I made. They loved learning the different types of penguins and where they lived in the world! 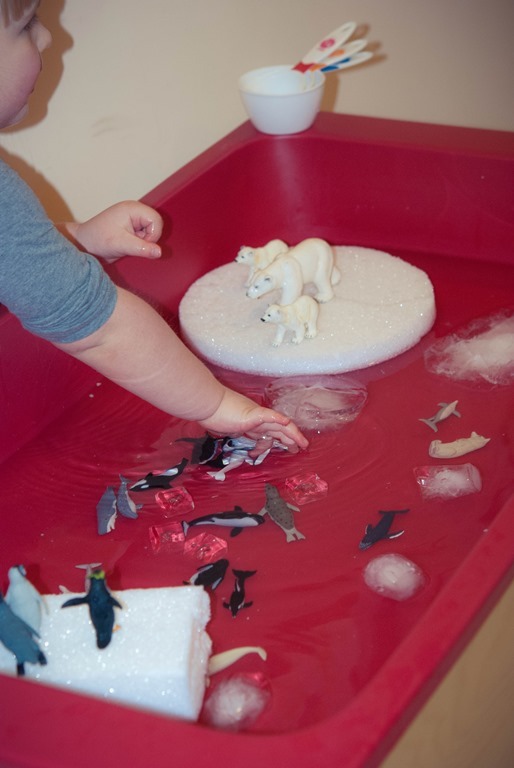 Categories: education, home based preschool, home preschool, preschool, sensory play | Tags: animals, art, invitation to play, penguins, preschool science, process art, sensory bins, sensory play, winter, winter crafts, winter themes | Permalink.